What is it about ice cream that makes it one of the world’s most loved comfort foods? Many nights, after having a hard day, I’ve cuddled up on the sofa with a small tub of ice cream after everyone else is asleep (I’ve eaten more tubs of Ben & Jerry’s than I care to admit! ); it always makes me feel better. There’s just something special about ice cream. I’ve tried making my own ice cream before, with the “hand-churning” method, but never really got excellent results. This is where you prepare your ice cream mixture, freeze it, then every 2 hours, take it out, scrape it into the bowl of an electric mixer, mix it to break up the ice crystals, scrape it back into the freezer bowl, freeze it, and repeat the entire process another 3 times. How annoying! And can you believe I have never owned an ice cream maker in my entire life? Yes, I do live under a rock. Ice cream makers basically do the “hand-churning” method for you. 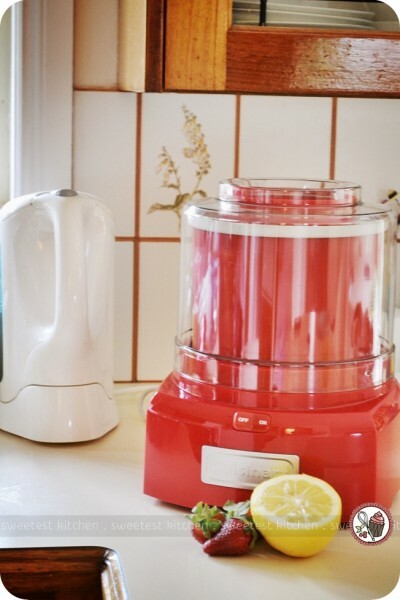 All you need to do is turn it on, pour your ice cream mixture in, and leave it for 15-20 minutes to churn the mixture, in a way that is similar to a stand mixer. After that you’ll have a soft-serve consistency, and if you would like it to be firmer, just pour it into a freezer-safe container and freeze for a few hours, scoop it out and enjoy. If you were to take a look at my Firefox bookmarks, you’d find heaps of ice cream recipes. Even though I’ve never had an ice cream maker, a girl can dream, right? I used my cherished Valrhona cocoa powder for this recipe and the results were spectacularly dark and delightfully creamy. This was an easy recipe, consisting of pantry staples (cocoa powder, sugar, and vanilla) and water. I wasn’t sure what to expect with my first go at sorbet and found that when the ice cream maker had been going for 20 minutes, the consistency of the sorbet was like a super-thick milkshake. I froze it for a few hours (it was about six, I think) to get it to scoopable consistency. It was really silky and smooth, I was quite pleased with myself! I didn’t realize what an ice cream maker actually was. It reminds me of my Zoku Quick Pop Maker; they both have a silvery surface that freezes liquids instantly (and wet fingers!). The ice cream maker has a big paddle attachment (sort of like a stand mixer) to keep the mixture constantly moving, ensuring the end result is creamy and smooth. There’s only one button on this machine, which is the on/off switch. While I gave the ice cream maker a test run with a sorbet, I wanted to make ice cream for my official review post. I chose a recipe in the latest issue of delicious. magazine for strawberry, basil and black pepper ice cream by one of my favorite food bloggers, Katie Quinn Davies from What Katie Ate. I had never tried basil and strawberry together before, although I had heard it is a great combination. But what is this about black pepper? I couldn’t resist making this recipe. Fresh strawberries, lemon, lime and basil! The strawberries will need to sit in the refrigerator to macerate with a bit of juice from the lemon and lime and some sugar for 2 hours. Afterwards, half of the strawberries will go in a blender, along with a few basil leaves and fresh finely ground black pepper to puree. The rest of the strawberries are to be crushed with a potato masher and set aside. Milk, cream and vanilla beans are added to the pureed strawberries. This mixture then goes into the ice cream maker. Don’t be too concerned about the size of this machine, by the way. It’s actually quite compact and fits easily into our cabinets. Compared with our kettle, it isn’t too much larger. According to reviews of this product on Kitchenware Direct, a common complaint seemed to be the noise of the machine while it was churning. Personally, I didn’t find the noise to be too loud. My food processor is much louder than this ice cream maker is! After 10 minutes of churning, the crushed strawberries are added to the mixture. After 20 minutes, I turned off the machine. The ice cream was at a very soft, soft-serve consistency. I had a taste and was surprised at how wonderfully tasty it was! I scraped out the ice cream into a freezer-safe container and froze it overnight. Scraping out the ice cream from the freezer bowl is a little tricky. You’ll need to use a silicone spoon or spatula as a hard plastic or metal one will damage the bowl. And once the machine stops churning, the ice cream starts sticking to the bowl. So I’ve discovered that you have to be pretty quick to scrape out the ice cream easily! The next morning, I sampled some ice cream. The texture was just like the ice cream I’m used to and scooped out easily. The flavor was brilliant! With the first bites, you can really taste the basil, and as you eat more, you start tasting the fresh strawberries. Every few bites, there’s a slight tingle from a piece of black pepper. My only complaint is that it left a sort of greasy-mouth feel for some reason, which was a little odd. But I can overlook that because this is some mighty delicious ice cream. I am absolutely thrilled to own my first ever ice cream maker and am now looking forward to working through my extensive list of ice cream recipes that I’ve bookmarked. I can guarantee you that there will be Biscoff ice cream, peanut butter ice cream and matcha ice cream to begin with, then I’ll work on some more interesting flavors. 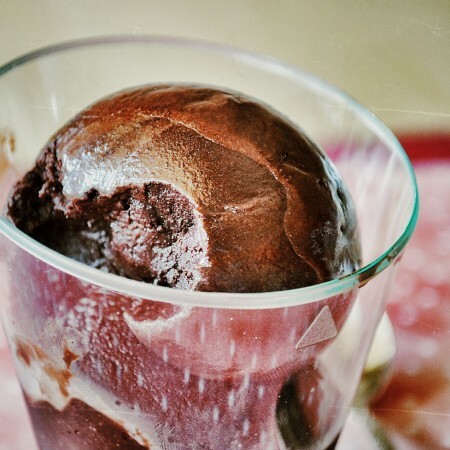 Recipes for the dark chocolate sorbet and strawberry, basil & black pepper ice cream are at the very end of this post. Now, how about this giveaway? If you live in Australia, you can enter to win your very own ice cream maker, just like mine, in your own choice of color – red, blue, orange, pink, yellow, or green. Prize is one Cuisinart 1.5 litre ice cream maker in the color of the winner’s choice, provided by Kitchenware Direct. Leave one comment only on this post and tell me your favorite ice cream flavor – for extra entries, as below, please leave a separate comment. For one extra entry, tweet about this giveaway and be sure to tag me (@jamieanne), then leave another comment here telling me about your tweet. For another extra entry, post about this giveaway on Facebook by liking my page, The Sweetest Kitchen, and tagging it in your post, then leave yet another comment here telling me about your post. This giveaway closes on Monday, October 29 at 11AM (AEST). One winner will be selected and notified by email, after which the winner will need to respond within 3 days or another winner will be selected, so be sure to include an active email address. This competition & review is made possible by Brad from Kitcheware Direct. Congratulations, Virginia Mason! Your tweet earned you a free Cuisinart ice cream maker in the color of your choice! Combine water, sugar and salt in a medium saucepan over medium-low heat. Cook mixture, stirring often, until sugar is completely dissolved. Gradually add cocoa powder to sugar mixture while whisking constantly until smooth. Add vanilla and stir to combine. Cover and refrigerate 2 to 3 hours, or overnight. Churn in an ice cream maker, according to the manufacturer’s instructions. The sorbet will be soft and creamy; transfer to an air-tight freezer-safe container and place in the freezer for a few hours until desired consistency is reached. Remove from freezer 15 minutes before serving. 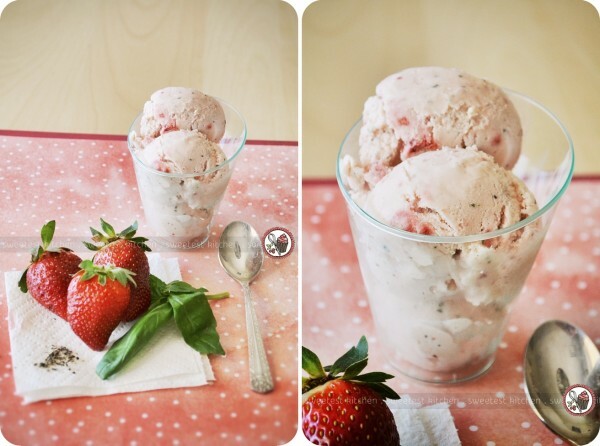 A refreshing strawberry ice cream with basil and black pepper. 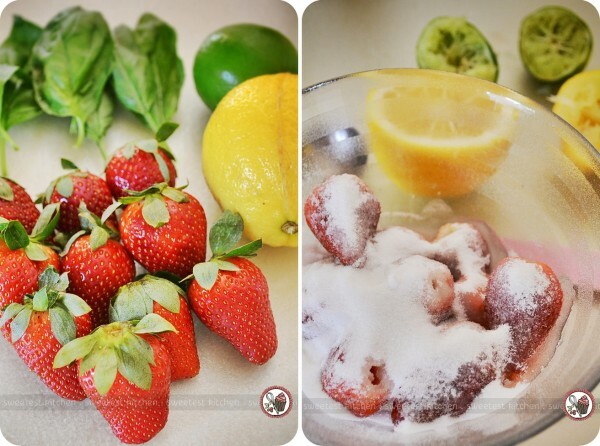 Place strawberries in a bowl with the lemon and lime juices and 55g sugar. Mix well, then cover with plastic wrap and place in the refrigerator for 2 hours to macerate. Place half the macerated strawberries in a food processor, along with the basil and pepper. Whiz for a few minutes to form a juicy pulp, then set aside. Crush the remaining macerated strawberries with a potato masher and set aside. Using an electric mixer, whisk the milk and remaining 110g sugar together for 2 minutes until the sugar has dissolved. Add creams, strawberry and basil puree, and vanilla seeds, then gently stir together. Chill overnight, if possible, or for at least 6-8 hours. Churn the chilled strawberry mixture in an ice cream machine according to the manufacturer’s instructions, adding the crushed strawberries 10 minutes before the end of churning. If you prefer a firmer ice cream, freeze for a few hours before serving. I love Nutella flavoured icecream! It’s everything I love when I spoon it out of the jar, but refreshing too! Ooooh, both of these look fabulous – and how strange about the greasy feeling from over-churning. The icecream maker I had (which was terrible) would take hours to freeze – but this sounds like it takes minutes! and it comes it pink so that has me sold! My favourite icecream flavour would HAVE to be chocolate gelato.- and that would be the first thing I would make! I love Christmas Pudding Ice Cream. My favourite icecream flavour is Love Potion 31 which is a white and dark choc icecream with little raspberry filled choc hearts and raspberry sauce swirled through. It’s divine! If I won this machine, I’d like to try out making kiwifruit sorbet for my husband, as well as a Key Lime Tart flavoured icecream. I like your Facebook page and I shared this competition on Facebook. My favorite flavor hands down had to be salted caramel and white chocolate. It’s bitter and sweet and I absolutely always need supervision! Peanut butter! I always choose that flavour if it’s available. I would choose Green… and make Vanilla Honeycomb and chocolate buttons icecream… just in time for Summer!! O man i would so want to try that, but it’s so frustrating going to my freezer every hour to mix the ice cream whilst it’s freezing up. I can’t go past hazlenut gelato and would love to perfect a recipe using this machine! I love a great lemon sorbet or lemon icecream – the more lemon the better! Passionfruit sorbet – I’m convinced passionfruit is a fruit from heaven. My favourite ice-cream is strawberries and cream – delicious in a waffle cone, bowl or straight out of the pot. I also like to think that is a healthy desert as it has fruit in it! I like The Sweetest Kitchen on facebook. I have shared this giveaway on facebook and tagged you in the post. Thanks for a chance at this delicious giveaway! I love the red one..I would start with Chocolate / strawberry icecream…my grandsons and I would have so much fun with this. Have shared on my facebook page and with friends as well. My favorite is raspberry ripple the delicate favors savory through onto your tongue and oh so yummy. Mango icecream is my favourite! I love, love, love, Cookies and cream ice cream! Vanilla bean, honey and macadamia nut ice cream, smooth not overly sweet with crunchy bits, who could ask for more? And Id choose a pink one cause everything my son picks for me is pink and he’d LOVE to help make his own ice cream. My favorite flavour is coffee with nuts blended through. Peanut butter – OH YUM! Is when the kids leave none for ME! My favourite Ice cream flavour is Lemon Pudding. I can’t wait to try and make it myself. My favourite ice cream flavour is coconut! It reminds me of holidays in exotic places and brings some sun in my life! Chocolate Chip Cookie Dough is my favorite! I love Rum and Raisin. Reminds me of my courting days when we would stop for an icecream on the way home from the beach! Hokey Pokey is my absolute fave and has been since I was a kid! Is that lame? Lol! Home made Lemon and thyme icecream is my favourite. my favourite icecream flavour is honeycomb. I adore Salted Caramel ice cream, so does Hubby the kids not so much. Do you see my evil plan…. Cookies and cream is definitely my favourite! have tweeted about this awesome prize! My favourite ice cream flavour is rosewater and pistachio – I make it with chunks of turkish delight in it, as well as moist coconut flakes – it is amazing! I would have to say I cant go past Honeycomb, gets me every time. I absolutely love key lime ice cream or secondly, sweet pumpkin and spice ice cream!! Definitely mango!! Love love love fresh mango sorbet yummy. Would love to try it with some fresh mint as well. I sooo Love Macadamia and chilli chocolate chip ice cream. It is the best AND it bites you back! My favourite ice cream flavour would definitely be Cookies and cream! It’s to die for especially when you get those crunchy cookie pieces! My favourite ice cream is hokey pokey. Never tried to make it but I would if I had an icecream maker!! I’d like the pink one! Ive tweeted about your amazing, generous giveaway!! Have tagged and shared on Facebook both The Sweetest Kitchen and the comp as well as the lovely suppliers of the awesome prize! 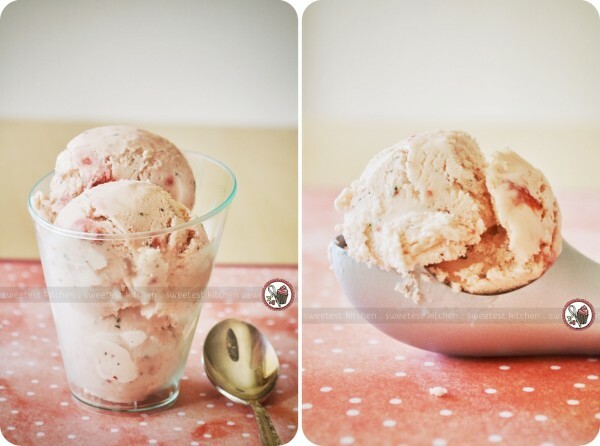 Strawberry & balsamic vinegar is the best ice cream I have ever tasted. Posted on my FB wall about this amazing prize…. My favorite ice cream flavour is liquorice….alway a winner with me. My favourite icecream is Hokey Pokey!! I posted your awesome giveaway on facebook. Ginger is a classic flavour and I for one love it especially with big chunks through it, if I had an ice cream maker I’d experiment by adding a different flavour to enhance it…maybe some nuts or honey comb. My all time favourite flavour would be mango. The fruit freezes well so can be enjoyed all year. However after looking at the photos above I am curious to try strawberry, basil and black pepper! And you just can’t go wrong with chocolate sorbet! My favourite flavour of ice cream is coffee flavoured or butterscotch. Espresso ice cream does it for me! I’m thinking coconut and pistachio combined into one delicious ice cream flavour! Have also liked and shared your page on Facebook. My favourite flavour would be black sesame! I love creamy vanilla ice-cream, with milo mixed through it! Plain ole simple chocolate icecream can’t be beaten! Loved hearing yr review on ice cream making, I have been curious about how these machines shape up!!! My fav recipes wd be salted caramel mind you, yr peanut butter version has me interested!!! I love macadamia nut and white chocolate chip! Rum and Raisin ice cream is the best! My favorite ice cream flavor is avocado and white chocolate. I know it sounds bizarre but the ago adds creaminess and cuts through the sweetness of the chocolate. Mmmmmmm. Rum and Raisin is the best! My happiest flavour is coconut, it just puts a smile on my face, and makes my taste buds sing. Peanut butter and honey. They are nice in a sandwich so I am sure the icecream will be delish too! Mint choc chip would have to be my fave! It’s my ultimate comfort food!!!! Coffee ice cream is a winner for me! Love it!!! My favourite flavour is gingerbread ice cream. Combines two of my favourite things, Ice Cream and Gingerbread. Perfect for Christmas. 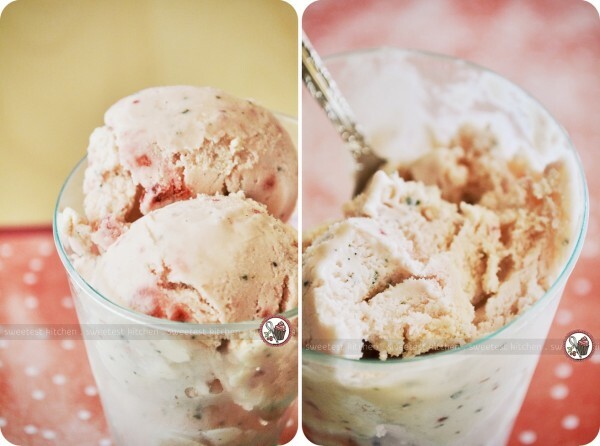 Peppermint choc chip ice cream. Miso salted caramel ice cream! Amazing! This post is inspirational. I have tried a number of ice cream makers ( and many high fat recipes ) all of which have been less than successful. Ice cream was too hard, totally unscoopable not to mention the calories!!! The chocolate sorbet sounds great and the strawberry, basil and black pepper sounds fantastic. How about a Chilli Chocolate flavour ice cream?? YUMMOO!!! 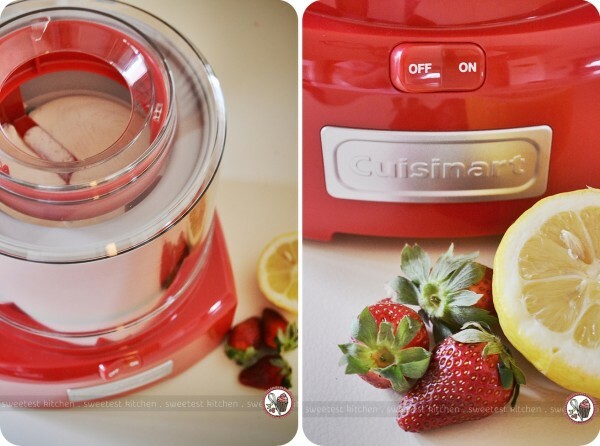 Oooohhhh The Sweetest Kitchen and Kitchenware Direct are giving away a Cuisinart Ice Cream maker . . . check it out!!! It certainly has it over the rest. I simply can;t find a word big enough to emphasise. Coconut, strawberry, lemon and macadamia nuts. At least this would be my favourite if I had an icecream maker!! I love strawberry flavour ice cream! Both my husband and I love liquorice flavoured icecream. It is not always available and but we love the strong flavour of it. My absolute favourite ice cream flavour is Green Tea!! I have posted on facebook as well and linked to this competition. Chinese Guava evokes the first taste of tropical childhood holidays in Mauritius. Pure bliss! Lemon Buttermilk Icecream is great for a hot day – lovely and tangy. My favourite definitely has to be dark chocolate with crunchy peanut butter chunks. I don’t doubt at all that I could eat my weight of it! When I go to a new ice-cream shop I start with chocolate flavor as I believe that if that is good the rest can be good too but if chocolate is not good than there is no hope …. That said, if I would have my own ice-cream maker than I would happily experiment on new flavors! Dark chocolate and fresh strawberry from my backyard would make a good start … then the wilderness of flavors could be set free! I love dark chocolate! Make it into an ice cream and it’s match made in heaven! I love Vanilla with Macadamia nuts – with chocolate topping. Wonder if there’s any in the fridge!!!!! Being born in Queenslad I like Macadamia Nut Ice cream, such a great hit with all my family and friends.being not as sweet as most icecreams. Tia Maria and Hazelnut gelato. Yummy! My favorite flavor is a simple vanilla, can’t beat it is it’s made with fresh vanilla pods! my favourite ice cream flavour is Cookies and cream yum !! My favourite is pistachio not just for the flavour but the gorgeous green colour! I love licorice flavoured ice-cream… have you ever looked at your face in the mirror after eating it?? Hahahaha time to feel like a kid again!!! I love licorice icecream yumbo !!!!!!!!!!! Fresh ginger ice cream with little chunks of glace ginger sprinklet through – this is the most delicous flavour I have ever made. I love vanilla and always go for that when ordering, buying a brand and hopefully making it; because if they can’t get vanilla right then there is something wrong. Vanilla is sweet, subtle and goes with most desserts. Gosh, that is a hard question to answer because I can never, ever go past any type of chocolate ice cream or gelati – the more chocolatey the better. There is a pasta shop near where I live that has this dangerous chocolate gelati that tastes like frozen chocolate pudding, so yummy! But I have been thinking lately of flavours I like and I think I would love to try watermelon lemon and mint ice cream. Donut ice cream. It’s pretty simple. Smush up some of thos eiced donuts with colourful sprinkles and mix them through vanilla ice cream. Freeze, then drool over. Yummo! I love chocolate chip ice cream. Americans do ice cream spectacularly! Their ice cream aisle is huge, overwhelming even. I remember one was chocolate but it had peanut butter and candy pieces through it. Cookie dough ice cream was a very sweet treat. My favourite flavour is hard. I have a soft spot for mango and macadamia but chocolate chip and cookies and cream are my fallback favourites. Is there a flavour of icecream that isn’t yummy…..I think not!!! Only one ice-cream for me-pineapple. Hard to find so would love to make it. Cookies and cream is my favourite flavour – yum! it would have to be anything with a nutty element…hazelnut, pistachio etc…and can never get enough chocolate! I recently discovered Baci a chocolate hazlenut flavoured sorbet after having my wisdom teeth out( so icecream was one of the only things I could eat). This is so delicious it has become one of my favourite flavours. My flavours mixed and quite accidentally discovered whilst pregnant with bubs 1 was Banana, chocolate and cashews! I thankfully back then work in a bistro so my drink was always a banana and choc milkshake on hand then if I was feeling okay I was addicted terribly addicted to having my icecream with choc and banana toppings and slightly crushed cashews over it all OMGOSH I was heaven and guess what I still eat it to today 8 years later! I love vanilla ice cream with slivers of hazelnut praline through it! Yummy! Whiskey caramel is my fav! I’ve liked you on Facebook, and posted a status update about your great comp, but couldn’t tag you in the post? is PEACE AND QUIET ice cream. for a while is my favourite flavour. something more exotic, it’s my saviour…. Ice cream in general just melts my mouth away. But my most recent one is Yoghurt Caramel, which i had whilst travelling in Sydney and have been craving for it since. No need to feel guilty after a huge scoop since it’s made from yoghurt. The smooth sweet caramel dissolves in my mouth. Yet i will never get sick from the sweetness, because the yoghurt gives each scoop a light sour tinge after each bite. What more can I ask for? Can someone tell me how to make Yoghurt Caramel Ice cream? I would make dark chocolate and chilli icecream. A match made in heaven. Rum & Raisin- it’s the best especially when you use real rum…now that’s good icecream for an adult!! Coffee, coffee, and coffee! I love all flavours but if coffee is on offer that’s the one for me. I love lemon icecream, so refreshing on a hot summers day. Chocolate chip cookie dough ice cream is the best! Love it and must only every buy small cartons of it b/c I eat it all in one sitting! My favourite is mango ice-cream, to be eaten with chopped macadamian nuts and butterscotch sauce. Mars Bar with a hint of Baileys Irish Creme. So deliciously sinful, it’s almost impossible to resist. Love Neopolitan, i get bored with one flavour so i like to keep my tastebuds guessing with a little of each! ive never made my own ice-cream but after reading above ill sure give it ago even though i dont have a machine it sound so yummy mmm good going!! Pistachio would have to be my all time favourite. I can’t go past Jaffa. My weak spot. I love all the different ice cream ideas. Some don’t sound great but I will definitely try it and may surprise myself. I have tweeted your fab page. I have shared your page my my family and friends on fb. Rocky Road Ice Cream epitomises heaven! Marshmallow! Nuts! Chocolate cookies are the best! When made it brings on cheers! I can’t work out if i love Cookies and Cream or Passionfruit Sorbet more….decisions, decisions..
birthday cake flavour– ice cream, sprinkles, little chunks of vanilla cake. it’s delicious! I would LOVE to experiment with new ice cream flavours! My absolute favourite is a memory from when I was a little girl. I think it was from one of the strawberry stands, because it was a vanilla & strawberry ice cream with real strawberry pieces in it. Yumm! Plain vanilla is my all time favourite – boring I know but sweet and dependable! I love triple choc swirl – chocolate ice cream with milk choc chips and white choc chips with swirls of chocolate topping – decadent but delicious! Vegan buttered popcorn!! Seriously. Amazing. My favourite ice-cream flavour of all time: Mango and Cream! It is heaven in your mouth and pure deliciousness! Pistacchio – I’m ‘Nuts’ about this flavour! Oh the pink one is so lovely! Reminds me of bubblegum. 🙂 My favourite has to be dark chocolate sorbet. I have only ever eaten it a couple of times when i’ve seen it in icecream shops, but it is amazing! Apricot and white chocolate icecream. Simply divine. I love Maggie Beer’s burnt fig, honeycomb, and caramel icecream. But I would love an icecream maker, as I’m about to go on a strict diet for medical reasons and will no longer be able to eat any commericial icecream. Beautiful creamy cookies and cream ice cream. I adore vanilla bean icing with a caramel ripple! So sweet but delicious and really dissolves my icecream cravings! Chocolate Chip! Smooth, rich creamy vanilla chocolate, bombarded with thousands of tiny choc chips. I would bathe in it if I could! love to make me own icecream slightly melted or using natural yoghurt. Slightly melt whatever flavour you like i’ll go with vanilla melt licorice swirl in then put in frezeer till frozen serve with mango pears strawberries kiwi fruit passionfruit either some diced the rest as a puree. Vanilla Bean Ice cream is my all time favourite…goes with everything! Our family does really like icecream but we just can’t eat all the new weird flavours. Just ordinary yummy icecream for us for now anyway. Lemon, most of the fondest memories. I once had apple pie ice cream in a shop on the Sunshine Coast and it was the nicest thing I’ve ever tasted! Chocolate Mint Icecream made with Peppermint Crisp bars and Dark Chocolate chunks. Pistachio flavoured Ice-cream for sure! It’s a close call between butterscotch and peppermint crisp … Yummy!! Dark Choc with fresh orange. Its heavenly! Passionfruit, basil and a touch of balsamic vinegar. dark chocolate with cherry ripe pieces!